If you find plain water to be kind of boring and dull, but want to avoid sweeteners or chemicals, try making some infused water. 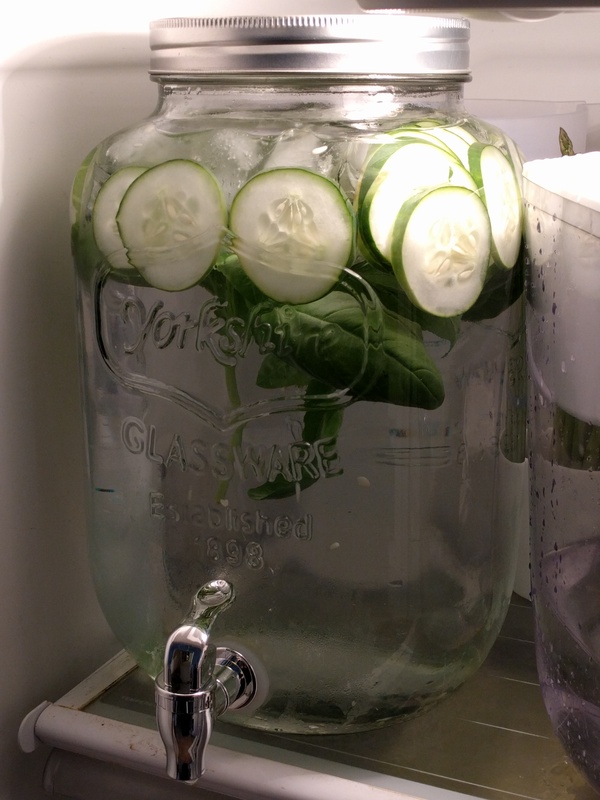 I recently bought a Mason jar beverage dispenser that I’ve used a couple times successfully to make cucumber and basil infused water. Like with my iced tea I prefer to just use Brita-filtered water. I find it to be fresher tasting and I live in an old house so I am a little worried about lead in my pipes. But maybe I’m just being paranoid, and I’m not sure the Brita will guarantee any improvement on that front… Anyway, it takes a few Brita-fuls of water to fill up the pitcher, but I think it’s worth it. A large container for the water. If you don’t want to get the 2-gallon jug I have, any container will do. But something with a dispensing spout is best. One basil plant (most supermarkets sell them in the spring/summer, at least around here). Chop the cucumber into coin shape pieces. 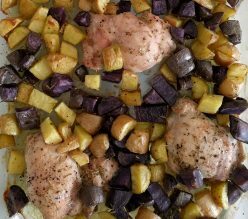 You want a lot of surface area to volume ratio for the flavor to be maximized. Pick the tops off of several branches of basil. Make sure you have at least a half dozen good sized leaves. Cut the basil stem just above the point where it forks off, leaving at least two branches remaining on that plant. It should grow more stem at that branching point over the next few weeks. Place cucumber slices and basil in the bottom of your water container. Caution: The glass jar that I bought came with instructions saying to not move it when full. I chose to ignore that: I fill it on the counter and then move it to the fridge – however I am very careful when lifting it! Remember, 2 gallons (about 7.5L) of water weighs about 16 pounds (about 7.5 kg) and you do not want glass and water all over your kitchen floor!! Advanced options: Try mixing in fruit such as lemons, strawberries, etc. This also works well when mixed with iced tea. What are your favorite combinations?